The University of Oxford is the second oldest University in the world after the University of Bologna in Bologna, Italy. Oxford was founded as early as the 11th century at the reign of King Henry II. 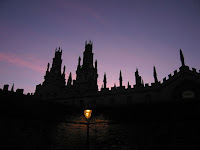 The records show that the King had banned English students from studying at the University of Bologna, thus a new College emerged in the town of Oxford. From its foundation at the end of the 11th century and until 1880s the student body at Oxford was primarily male. The first four women's colleges were started at the end of the 19th century. Oxford University comprises forty separate, self-governing Colleges and Halls. The focus of studies on the undergraduate level at Oxford is on weekly tutorials (small-group discussions with a professor, tutor) and on essays on a variety of subjects. Students also attend lectures, seminars and do lab assignments. Oxford is one of the best Universities of the UK and has been listed as one of the top-ten Universities of the world for the last several years. 1. What is the oldest University in the world? 2. Under which circumstances was Oxford founded? 3. Was the University of Oxford "co-ed" from the very beginning? 4. What is the structure of the University? 5. Describe the mode of studies at Oxford. How is it different from other Universities? Assignment 4: Do a research to find out more information about Oxford: the city, the University, and its famous students. Share what you have learned orally or in written. Thank you, Elena,for this information. Many years ago I studied at one of language centres in Oxford. Irina, thank you for your feedback. I'm working on a series of programs on England (landmarks right now, later I am planning to work on "the people of England). I'm learning a lot from this, too. Thanks for stopping by. Thank you, Elena,for useful and interesting information, especially for vocabulary.